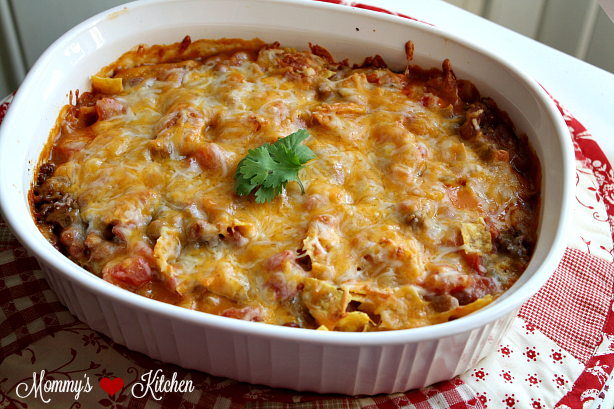 Layers of ground beef, Doritos chips, chili beans, Rotel tomatoes and cheese make up this ooey-gooey casserole. Today I'm sharing a recipe that comes from my husbands Ma maw. I know what you're thinking by the title alone, Dorito Beef Casserole that's horrible for you. It probably is, but sometimes we just need a good dose of ooey gooey "bad for you" comfort food. We love Mexican food, so I thought everyone would like this casserole. I told my husband I was making it and he said Ma maw was a great cook, so it should be good. This recipe calls for pantry friendly ingredients that you probably have on hand. I've tried making similar Dorito Casseroles in the past, but they always turn out dry. Well not this time! Ma maw's casserole turned out ooey gooey good. I really think the dryness comes from overcooking the casserole. I baked mine for 30 - 40 minutes or just until hot and bubbly around the edges. The meat is precooked, so the flavors just really need to blend and heat through. Ma maw was a wonderful cook, so I'm glad I gave this recipe a try. There's just something about making a recipe that's been handed down from generations before us. Maybe it's the writing or just seeing the tattered written recipe that makes us feel close to them again. 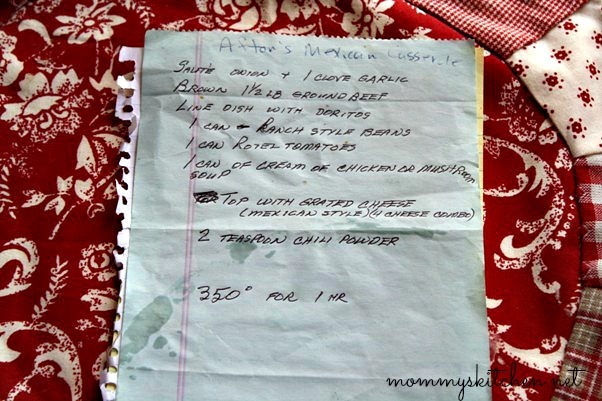 I love how old family recipes look. They're usually just jotted down on recipe cards or a scrap piece of paper that has become worn over the years. Most times the ingredients or directions are a bit off and confusing, but I always figure it out.I found this recipe tucked away in my mother in laws recipe binder. Sadly my husbands step mom and Ma maw passed away a little over a year go. I'm so glad I have some of their recipes, so I can continue cooking our favorite dishes. ❤ I took a few step-by-step photos to show you how easily this casserole came together. Start by pre- heating the oven to 350 degrees. In a large skillet brown the ground beef with onion and garlic and drain off any grease. Add the ranch style beans and chili powder; lightly mix to combine and set aside. In a separate bowl combine the soup and the Rotel tomatoes and set aside. Place a layer of slightly crushed Doritos in the bottom of a greased 2 quart, 9x9 inch or 8x8 inch casserole dish. Add half of the ground beef mixture and half of the soup mixture. Top with 1 cup of shredded cheese. Repeat layers a second time ending with shredded cheese. Place in a 350 degree oven and bake for 30 - 35 minute or just until casserole is hot and bubbly around the edges. Place a layer of slightly crushed Doritos in the bottom of a greased 2 quart, 9 x 9 inch or 8 x 8 x 2 inch casserole dish. Add half of the ground beef mixture and half of the soup mixture. Top with 1 cup of shredded cheese. Repeat layers a second time ending with the remaining shredded cheese. Place in a 350 degree oven and bake for 30 - 35 minutes or just until hot and bubbly around the edges. This casserole is great served with Cilantro Lime Rice and Flour Tortillas on the side. Need more recipe ideas? Check out the Recipe Index by Mommy Kitchen. Don't miss a single recipe from Mommy's Kitchen. Click here to become a Email Subscriber. I'm going to pin this! I have tried a Dorito Chicken recipe but it was bland and almost dry. This look better and I have all those ingredients in the cupboard, beside the beans! Yum! There is NOTHING like good old family recipes!! I have my Mama's old tin box of scribbled recipes too. Plus they were all scanned and put on CD's for other family members. What are ranch style beans? Haven't heard of them before. Thanks! Ranch style beans are chili beans. My mouth is watering! I love these kind of dishes and our kids would too! You know how this stuff goes around my house!!! Never any left overs!!! I like adding the spicier Doritos for a little kick! YUM! What size bag of Doritos? 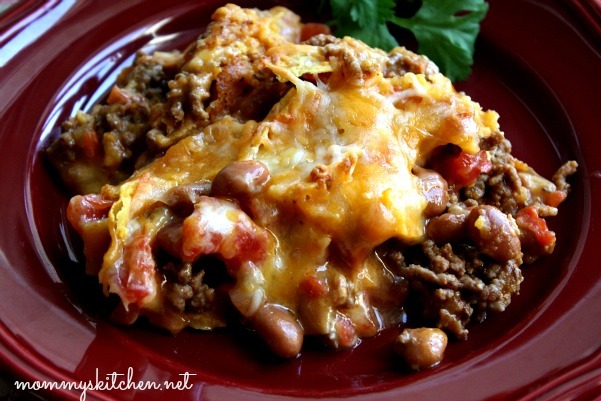 My Mexican Casserole is almost identical to this one. I use cream of mushroom leave out the beans and chili powder. I season the meat with salt, pepper, garlic powder, and ground cumin. I love it SO much! You can substitute diced and cooked chicken breast for the ground beef and you've made a super easy King Ranch Casserole. Bookmarked this a while ago and finally made it tonight. I actually assembled the casserole last evening and popped it in the fridge to cook when I got home tonight. It was a HUGE hit for my very picky family! Used black beans because that was what I had on hand. Thanks so much for sharing this keeper! This looks soooo good! I know we would love it. Pinning! Can I freeze this? advice? I noticed Ma Maw used 1-1/2 pounds of ground beef. Did you decide that 1 pound works better? Thanks. I used one pound of ground beef, so it really doesn't matter. It just depends on how meaty you want the casserole. I made this for dinner last night and it was awesome! My whole family absolutely loved it. I will def be making this again. I made this last night and it was delicious!! my family devoured it in record time! The only thing I'll do different next time is to use a 2 qt casserole dish instead of the 13 x 9. My layers were a little thinner than I had hoped for. Great recipe!!!! I'm not crazy about beans, so I used 1/2 a can and added cumin and1 cup of good quality frozen corn and a small can of sliced black olives. Worked out real well! I like to use nacho cheese Doritos instead of the regular chips. I just made this and all I can say is WOW!! This is going to be a favorite as my husband loved it as did I. I made it just like the recipe called for and would not leave anything out. I needed a recipe for a casserole for a sick friend. I figured anything passed down from Ma maw was worth a try. Just "field tested" it on my fussy eater husband who really doesn't care for casseroles. He LOVED it and went back for thirds. Hope your Ma maw is smiling from heaven! Thanks for a great recipe. I hope the dish is tasty!! Fixing to try it out. Wish the PRINTER friendly version was actually PRINTER friendly. 7 pages, color with photos and all the blogging?!?!?!?!? The printfriendly is "Printer Friendly". You are not seeing all the options once your print friendly page is generated. There are options at the top of the page you need to look at. A box to check that says "No Images" and as you go down into the actual text "X" come up that give you the option to delete text. If you do not like going through the steps then just copy the text (just the recipe) and right click on your mouse and choose "Print" from your browser and check the box "selection" then print and it will only print what you selected. I make this recipe but use refried beans , its delish whole family loves it very rare to gave leftovers but if we do they dont last. I wonder if this would work with chicken, my little girl refuses to eat beef! This was a hit at my house. I had to make from scratch the ranch style beans because in Canada it is not stocked in grocery stores. I used cool ranch doritos and soup of celery because that is what I had on hand. I served this casserole over a bed of thinly sliced romaine,diced tomatoes,cucumber and olives. Drizzled with some garlic and bacon ceasar dressing. So happy you posted this! My Mom used to make something called Taco Pie...the ingredients look pretty much the same..I'm thinking it was the same recipe that was popular in the 80's...can't wait to make it!! How does this keep? I'm worried about leftovers for my little family. Also has anyone used anything other than beef? I'd like to try turkey? Looks delicious! This dish is best the day it is made. Leftovers might get a bit soft from the chips sitting. I have used ground turkey in this recipe as well. Made this last night as a last minute budget meal. Had some leftover smoked brisket and used that instead f ground beef to save some money. Was delicious. I don't know if it is just me but I had to double the soup/rotel mix. In a 13x9 pan, I couldn't get it to stretch to cover twice. Other than that, was absolutely perfect and everyone loved! loved this....I didn't have ranch style beans so I just seasoned a can of pinto beans with pinto bean seasoning.I also used a gluten free cream of chicken soup replacement recipe from food.com since I didn't have any cream of chicken soup. But other than subbing for a couple of things I didn't have on hand (which didn't really change anything), I followed the directions as written. This is definitely going into the normal rotation! I've also tried your cream peas recipe (THANK YOU - I didn't know what they were and my new husband loves them and requested them! You saved me!) Looking forward to trying some other stuff of yours too! This looks amazing. I think when i make it I will use the Nacho Cheese Doritos instead. Also what would you think about doing this as a crock pot recipe and just leaving it for about 4 hours on a high setting? Chili beans are pinto beans in a chili sauce. Pinto beans are just plain canned pinto beans. exactly as it is but with a can of sliced jalapenos. Do I drain the beans and rotel? Hi:) I love all your recipes here! You have the best recipes ever. My mom used to make this recipe with Fritos corn chips on top. I will try the Doritos on bottom layer and sprinkle the top with Fritos!! I bet kids love this dinner! CAN YOU USE SOME OTHER SOUP INSTEAD OF CHICKEN SOUP . . MAYBE MUSHROOM CHICKEN DOESN'T SEEM TO GO WITH RECIPE TO ME . . I don't recommend freezing this dish pre baked or as leftovers. With the sauce and the chips it will just end up being soggy. I tried this recipe however I kind of changed it up a little bit. I used 1 1/2 of ground beef, onion powder, chopped onions cooked all together with meat. Then after the meat was done in the skillet with the meat i added 1 can of rotel drained, 1 can of chili beans, 1 can of cream of chicken , and one can of nacho cheese soup. I let that warm til bubble. Then I just layered my pan with the meat soup,doritos and cheese. Let stay in oven for given time above. And YES very good. My family loved it gone in minutes!! Thank you! Tonya K, a 13 x 9 inch pan would be too big for this recipe and there wouldn't be enough ingredients to make two layers. The recipe suggests a 2 quart, 9 x 9 in or 8 x 8 inch baking pan. If you use a 13 x 9 inch pan you would only get one layer of the meat, soup mixture and cheese unless you double all the ingredients. If you can please middle school students, you can please anyone :) Thank you. Dorito corn chips are no longer available :( Fritos or Nacho cheese Doritos? looks awesome. What can be used in place of rotel tomatoes? We don't have those here in Canada. Ive always used taco flavor chips, this goes down so easy!